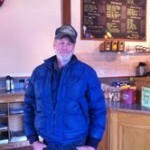 Cliff Anderson lost his home in 2008 when a fire broke out in his apartment. Almost four years later and after making $41,420 in payments to remain in Community Action Partnership of San Luis Obispo’s case management, Anderson still has no home. “They said they are going to get me into housing any day,” Anderson said last week. However, he remains in the Maxine Lewis Homeless Shelter — and nearly all of the money he’s entrusted to CAPSLO’s case management appears to have disappeared. CAPSLO’s administration requires homeless who sleep in the shelter or a car parked in their lot to make the program the payee for their government checks. Case management then keeps 50 to 70 percent of a client’s money with claims it is placed into a secure account to be used in the future to pay for housing. Anderson’s situation with CAPSLO is not unique. CalCoastNews has spent two years investigating CAPSLO and interviewing people the quasi-public agency claims to serve. CCN has learned that CAPSLO has engaged in practices that have homeless people giving the partnership much of the public assistance money they receive, but getting little or nothing in return. In Anderson’s case, he has signed over his disability benefits to case management for the last three and a half years, Social Security records show. CAPSLO administration claims collected money belongs to the client, and is being saved in order to get them into housing. There is no charge for staying at the shelter. In Social Security benefits, Anderson brings in about $970 a month; CAPSLO permits him to keep $400 per month which leaves case management owing him about $20,000. In addition, his case manager charges Anderson $25 every few months to run credit checks to determine if he qualifies for housing, and he is required pay about $37 a month for others to manage his money. The federal government requires that entities trying to become payees for disabled clients receiving SSI attend special meetings where Social Security officials inform them that people on SSI must spend the benefits they receive. Disability money is required to be expended each month on necessities, not saved in the bank. People on SSI can only save a total of $2,000 out of their SSI payments. And each year, the entities, known as payees, have to confirm to the Social Security Administration that recipients have not saved more than $2,000. It is considered fraud to misreport. An SSI recipient or payee is responsible for returning payments to the federal government after the $2,000 limit has been reached. That means CAPSLO or Family Ties, a company retained by the agency, owes the Social Security Administration approximately $37,000 for misreporting Anderson’s account. But CAPSLO says it doesn’t owe anything. CAPSLO Chief Operating Officer Jim Famalette claims that CAPSLO’s case managers are not the payees taking Anderson’s money. Anderson and the people like him are working with Family Ties, not CAPSLO, according to Famalette. “We do not act as a payee for those funds,” Famalette said in an email to CalCoastNews. But Lisa Niesen, Family Ties’ owner, said her company is not the payee getting the SSI payments for CAPSLO’s homeless clients. In any event, most of the client accounts contain minimal balances, she said. “None of the clients we have from case management have more than a few thousand dollars in their account, and most have just $20 to $30,” Niesen said. Several of CAPSLO’s homeless clients said they do not have an agreement with Family Ties. Niesen said her company’s agreement is with CAPSLO, not the case management clients. SSI records for Anderson list Family Ties as the recipient for his money, but when homeless clients have questions about their accounts, they are required to deal with CAPSLO case managers. In the past two years, homeless clients of CAPSLO have approached CalCoastNews with allegations that CAPSLO case managers often refuse to return all client monies when they leave the program or sometimes give a small percentage of what they are owed. If clients complain, they are barred from receiving CAPSLO homeless services. Several current and former case managers have also said that they believe money is being embezzled from the clients’ accounts. For years, CAPSLO administrators have refused to respond to allegations of missing funds, or to answer questions about what happens to a client’s money if they die. Meanwhile, CAPSLO is working to get approval for a 200-bed shelter and an overnight parking program. The parking program eventually would accommodate 200 vehicles. Dee Torres asks the San Luis Obispo City Council to approve more aggressive treatment of the homeless who do not enter case management. In March, the San Luis Obispo City Council entertained CAPSLO’s proposal to increase ticketing of homeless who sleep in their vehicles without agreeing to participate in case management, which requires giving CAPSLO case management a portion of their income. Proponents of the more aggressive ticketing include San Luis Obispo County Supervisor Adam Hill. Hill is in a relationship with CAPSLO’s Homeless Services Coordinator Dee Torres. Torres and Hill did not respond to requests for comment. 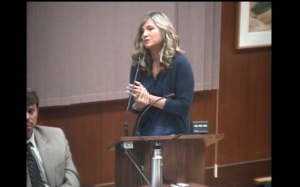 When Torres brought the proposal to the SLO City Council, Hill asked the council not to heed comments by members of the public who oppose Torres’ proposal. He said that the issue of homelessness is too complicated for most lay people to understand. Torres argued for the change, claiming that CAPSLO had already managed to get five homeless clients in the parking program into housing. One client, Gulf War veteran Kimberly Frey-Griffin, said the claim was not accurate. Though she did get into housing, she said it was in spite of CAPSLO. From December 2011 through May 2012, Frey-Griffin paid her case manager $25 to $50 a week she earned from cleaning houses. After more than five months in the program, on her own, she found and paid to get herself into housing. When she asked for her approximately $700 back, her case manager handed her a check for $133, and then added Frey-Griffin to the CAPSLO list of housing success stories. Nevertheless, public officials throughout the county, many of whom sit on the CAPSLO Board of Directors, are the first to applaud CAPSLO for its work with the homeless. He is a shell of a man, 6 feet tall and only 158 pounds, afflicted with severe edema and varicose veins, he lives in unrelenting agony. He spends his days exposed to the elements, weathered beyond his years, trying to navigate the dangerous and homeless world of violent drug addicts, the mentally ill and those looking to steal what little he has. He is a 69-year-old San Luis Obispo native who worked as a butcher most of his life, spending about a decade employed at the United Meat Market in San Luis Obispo. It is a difficult life at the Maxine Lewis Shelter. Staff awaken clients at 6 a.m. to do chores, and then require the clients to leave by 7 a.m. Cliff Anderson often sits by the railroad tracks waiting for the 10 a.m. bus to the Prado Day Center, where he is exposed to the elements because CAPSLO management contends there is not enough money available to open the warming center. The Prado warming center has been open only four days this year, despite a $25,000 donation last year from PG&E to benefit energy efficiency at Prado. The money was spent installing an air conditioning unit in the staff office area. Anderson must be waiting outside the shelter each night at 5 p.m., even though check-in does not start until 6 p.m. Once inside, clients are not permitted to watch television except on Saturday and Sunday evenings. Conversely, the North County shelter allows their clients to watch television each evening until 10 p.m.
Anderson’s cowboy boots are worn and uncomfortable. 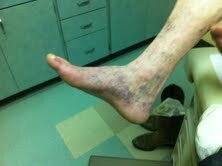 His feet are swollen and covered in veins. Anderson said a doctor had told him to get new shoes. But he has no money. Nevertheless, his numerous requests to case managers — some witnessed by CalCoastNews reporters — to provide some of his own money to purchase a new pair of shoes have been rebuffed or ignored. Other homeless clients of CAPSLO tell similar stories of their medical needs not being met because their case managers refuse to provide the clients own money to do so. Who are the poor but YOU? Would love to know who posted that piece of trash. It was probably Lisa herself looking for my clients to steal from. If she is doing this to the homeless just think of all the disabled clients she has oversiight for at the County. And of course, County Council and the DA office will do nothing to investiage these misdeeds which leads one to think about all the other activities at th County/City which may need review and of course on one wants to open anyone else’s can of bad deeds. Talk about stealing from the poor! I could sit here and recap more then that.. DA Shea senior abuse Kat Ladnerbak and this county’s adult abuse department DOES nothing.I could write a long list.. I could write a book..Thank CNN for their investigation.. Even seniors here needing protection from their own county.. who are not homeless do not get answered. Instead they have to protect themselves from abuse, because it might be a close friend of the Chief of police. Way to much corruption.. FBI.Kamala Harris already knows. Feb. 2012: Ramp up of the Criminalization of the homeless sleeping in vehicles. Mar.2012: Public outcry over the treatment and strong arm tactics by the city and police. Mar. 2012 Council Meeting: City adopts CapSLO’s pilot Safe Parking program (5 spaces) to quiet the masses. Asked to suspend the parking ordinance targeting the homeless till a parking program was truly functional -DENIED. Told unconstitutional – DENIED. CapSLO & City go down this road hand in hand, each patting each other on the back. April 2012: City hit with lawsuit to STOP the illegal ticketing and harassment of the homeless sleeping in vehicles. July 2012: Court Injunction granted – all enforcement stopped. But wait…..
July 2012: No matter, City Council has that all figure out. Skirt the law and immediately adopt an “Emergency” duplicate ordinance. Smells the same and tastes the same with a new name, number, and plopped into the morals code. Dang… Take that homeless & judge. I bring this up to point out that the City & CapSLO are tied together rather too tightly to have a good outcome for a true investigation. One person commented on this site, SECONDED by Dee Torres, and said “why don’t you file criminal charges”? Do you really think the city will investigate CAPSLO with its track record? My Top picks are the Attorney General, FBI and Social Security Department. Welcome to the happiest place in America!